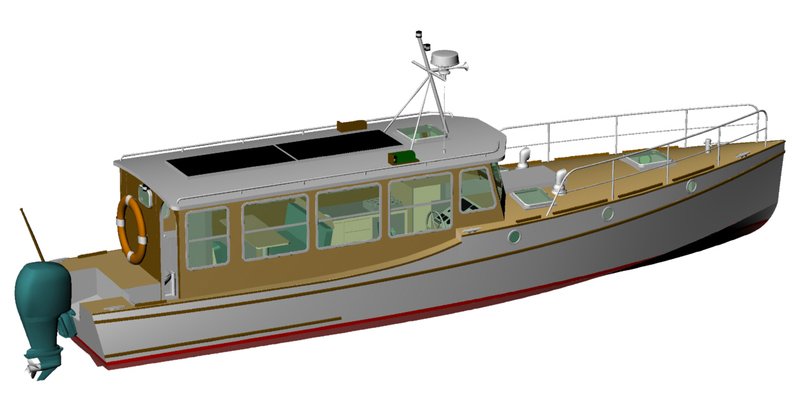 In the following pages, you will find different boat already built, building, or with more simplicity projects. Please to see below some representative design. Clic on the link for a direct access to the page. 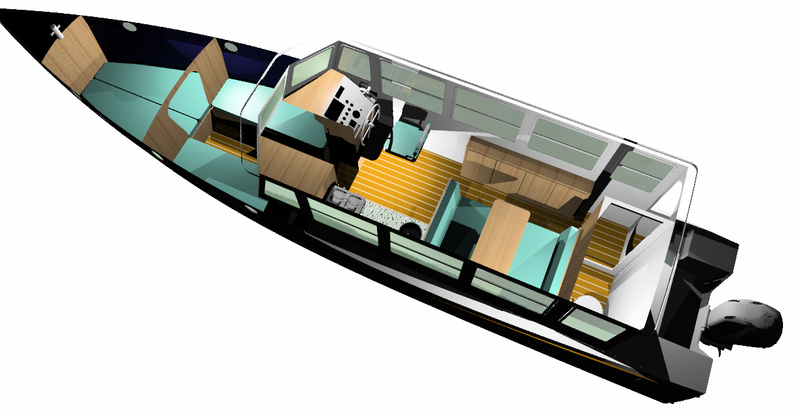 The SolarGoal is a small environment friendly catamaran 6,50m long with electric propulsion, usable without permit and est un petit catamaran écologique de 6,50m à propulsion électrique, utilisable sans permis, and refillable free by its solar panels. For an episodical use, the weekend for example, the boat will be always ready to take the sea, or the channels and rivers. It is livable with a small kitchen and a WC. This electro-solar shuttle able to transport 40 passengers is being studied for a startup with Saint Martin at the end of 2012. The idea is to have a shuttle service whose ecological impact is neutral. Construction in strip planking and plywood epoxy. 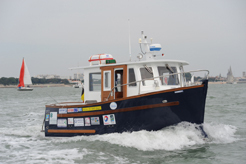 Solar panels on board and ashore will provide all energy necessary. Thanks to the use of batteries lithium-ion, the engine output will be important and thus the duration of rather short rotations. A touristic activity is also planed. 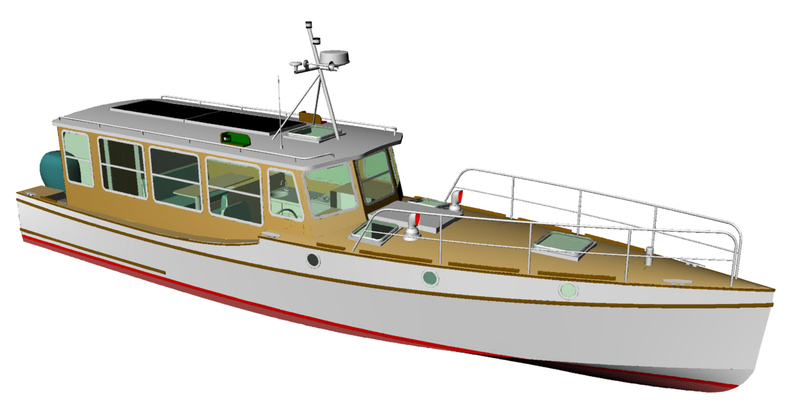 Fishing boat inspired by model "Saintoise"
Studied to answer the requests of the regional and European authorities which wish to see the fishermen deviating from the coastal zone, this boat has the range and the sleeping to make it possible to remain several days at sea. Fix refrigerator, ice machine, all is designed to practice traditional fishings of these areas. The hull, based on that of traditional “saintoises” will pass well at sea. 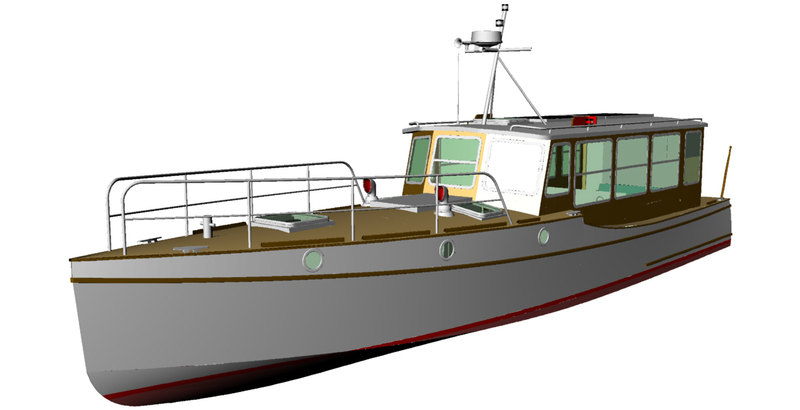 Two drawings are proposed: one, single engine with a displacement hull out of thick aluminum, the other with two engines and a traditional aluminum structure with stringers and frames. FIN "Bateau Bleu Challenge 2011"
Within the opportunity of the contest of the “Bateau Bleu” organized by the Federation of Nautical Industries, and aiming to propelling energy saving of the boats, the cabinet currently develops the project of a ship able to draw its energy from its environment according to a innovating track, in the long term more rational and more powerful than the photovoltaic one. The partners interested, scientific, industrial or financial, are invited to join us. Mayrik "Novicat 430" & "417"
boats that you can carry in container!!! !